Every honey bee hive has a queen, and only bees can produce honey bee queens. Queen production peaks in the spring when there are drone bees available to mate with the queens. Timing is critical in queen rearing. I assisted a group of Arkansas beekeepers who performed the steps required to produce a number of queens. Strong and healthy honey bee colonies reproduce on a colony-wide basis by swarming. Swarming is the culmination of a month-long process in which the colony divides and half of the bees fly away to find a new nest. One of the final steps in swarming involves the colony producing one or more queen bees. This natural process of producing queens was replicated by G. M. Doolittle more than one hundred years ago, and the Doolittle Method is used today to produce queens world-wide. This method requires beekeepers to establish a number of different hives for queen production with each hive set-up to accommodate a different step in the queens’ development. 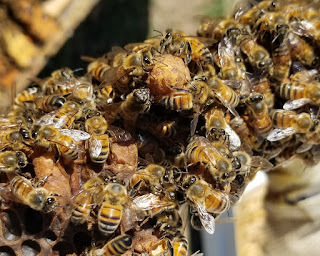 Typically, beekeepers establish queen-mother hives, queen-cell-starter hives, queen-cell-finisher hives, and queen-mating-nucleus hives with bees of the appropriate age and necessary food. This hive preparation is often a shared endeavor among cooperating beekeepers. Our early-April queen production effort involved six seasoned beekeepers. On grafting day, we searched the queen-mother hives for one-day-old larvae to graft into queen cell cups. Worker bees tend to these young larvae and convert them into queen bees. We found that our first queen-mother hive had progressed in its natural manner toward swarming. The queen had stopped laying eggs, and day-old larvae were not available. We found four queen cells produced for swarming, like the one in today’s photo by Desmond Simmons. One queen was actually in the process of emerging as an adult. We used these queen cells to produce four additional colonies. Grafting continued successfully with larvae taken from other hives. At the end of the day we started the development of queens for two hundred new hives.